Arbol Pepper and Tomatillo Salsa – Very Savory! The tomatillo is an ingredient that is very present in the Mexican salsas and in many other dishes. It is such its presence that the Mexicans look for different ways of combining them to generate more fabulous recipes. 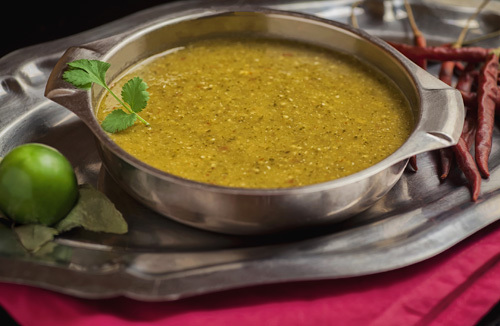 In this case the tomatillo is combined with the arbol pepper therefore it is a very spicy salsa , it also has an acidic touch and is very well seasoned thanks to the other ingredients that are used in the preparation. If you like how this salsa sounds... get ready to taste it with your favorite tacos – it is a very savory combination. In this preparation you are only going to perform simple activities. This salsa is very spicy because 5 arbol peppers are used, if you want it to be moderately spicy just use 3 arbol peppers. About 10 minutes are needed to make the salsa. The recipe is for 2 cups of salsa. Transfer from the saucepan to a blender, with some tongs, the tomatillos that were cooked; then reserve. Roast the chilies for approximately 1 minute and the garlic for approximately 1½ minutes, until all their sides are moderately roasted; move them regularly with the tongs. Transfer from the griddle to the blender, with the tongs, the chilies that were roasted; then reserve. Suggestion: Since this salsa is very spicy you should have a Mexican drink handy. These arbol peppers are of very good quality. Put the salsa in this bowl it will look beautiful. This is the best griddle that can be used to roast ingredients.